The leader of banned neo-Nazi group National Action has been jailed for eight years. Christopher Lythgoe, 32, was arrested by police investigating a plot to murder Labour MP Rosie Cooper and a female police officer. It came just over a year after fellow Labour MP Jo Cox was shot and stabbed to death in her Batley and Spen constituency by neo-Nazi Thomas Mair. The plan was foiled by a whistle-blower Robbie Mullen, who leaked details of a meeting at the Friar Penketh pub in Warrington to campaigner group Hope Not Hate in July last year. Jack Renshaw, 23, from Skelmersdale, Lancashire, has pleaded guilty to preparing to engage in an act of terrorism in relation to the plot and threatening a police officer. He has also been convicted of stirring up racial hatred in speeches in 2016, it can now be reported. Lythgoe, from Warrington, was charged with being a member of National Action after it was banned by the Home Secretary over its support for the murder of Mrs Cox. He was also accused of encouraging the murder of West Lancashire Labour MP Ms Cooper by telling Renshaw not to "f*** it up" during the meeting on July 1. A jury deliberated for 20 hours at the Old Bailey to find him guilty of membership of National Action but not guilty of encouraging Renshaw. 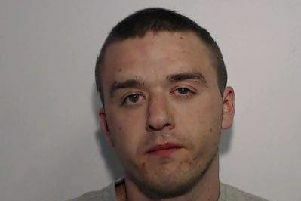 Prominent member Matthew Hankinson, 24, of Newton-le-Willows, Merseyside, was also found guilty of belonging to National Action and was jailed for six years. The jury acquitted Garron Helm, 24, of Seaforth, Merseyside, of the same charge. Mr Justice Jay described National Action as having a "truly evil and dystopian vision" of waging a race war. Without Lythgoe's obsessive determination to keep it going it would have "withered and died on the vine". While numbers were too small to achieve its aims, there was a real risk it could have inspired acts of terror by its perverted ideology, the judge said. Mr Justice Jay told Lythgoe: "You are a fully-fledged neo-Nazi complete with deep-seated racism and anti-Semitism. He added that Lythgoe "did nothing to stop or discourage" the plot to kill Ms Cooper. He told Hankinson that he was also a prominent member who hated ethnic minorities and Jews, and advocated violence. Ms Cooper sat in court as the men were jailed. The MP said in a statement: "I think it's awful that any public servant - teacher, nurse, doctor, police, MP - should be targeted and threatened with violence simply because of the job they do. "To that end, I'd like to thank Robbie Mullen, whose information saved my life. "I'd also like to thank Lancashire and Merseyside Police and the counter-terrorism police who have supported me greatly, and who have kept me, my staff and the general public safe." At its height, it had a membership of up to 100 young white men, drawn from universities. Dressed in black skull masks, they would gather for flash demonstrations, waving banners and making Nazi salutes. In December 2016, the group was banned by the then home secretary Amber Rudd over its support for the murder of Mrs Cox. Jurors were told that warehouse worker Lythgoe had regarded the death of the 41-year-old MP as a "little victory". He reacted to news of the ban by telling members that they would "just shed one skin for another". The prosecution alleged they continued to meet in pubs and train together at a new mixed martial arts gym in Warrington. The defendants denied being members of National Action. Lythgoe's lawyer, Crispin Aylett QC, suggested Mr Mullen had implicated National Action because he was "in the pocket of Hope Not Hate" and it was what they wanted to hear. Renshaw was accused of being a member of National Action along with Lythgoe, Hankinson, Andrew Clarke, Michal Trubini and Garron Helm. The jury failed to reach verdicts on Renshaw, Clarke, 33, and Trubini, 35, from Warrington. In his sentencing, Mr Justice Jay said that, under Lythgoe's leadership, National Action meetings continued on a "modest" scale. They kept alive "an aspiration which was truly insidious and evil - the idea that this country should be purged of its ethnic minorities and its Jews, that the rule of law should be subverted, and that once the ideological revolution had taken place this national socialist worldview would triumph", he said. "The idea that there could be such a triumph without violence is arrant nonsense, despite the weasel words to the contrary." The judge added: "Fortunately, and I can take this into account to some extent in the defendants' favour, the truly evil and dystopian vision I am describing could never have been achieved through the activities of National Action, a very small group operating at the very periphery of far-right wing extremism. "The real risk to society inheres instead in the carrying out of isolated acts of terror inspired by the perverted ideology I have been describing." Detective Superintendent Will Chatterton, head of investigations for counter-terrorism policing for the North West, said outside court: "I would like to thank the jury for their careful deliberations during what has been a complex and lengthy six-week trial. "Today's result has enabled the spotlight to be shone on the sickening activities of the banned extreme right-wing organisation National Action. "During the trial, one of those jailed today stood before the court and openly denied the Holocaust had taken place - an unimaginably horrific event that resulted in the murder of millions of Jews at the hands of the Nazi regime. "Today's result is a body blow to extreme right-wing organisations such as National Action. "It sends out a clear message that counter-terrorism officers and partner agencies will rigorously identify and investigate any violently extreme individual or group who seek to bring a reign of terror to our shores."